A dental bridge is custom made false tooth or teeth placed permanently between two healthy teeth, filling in the areas left by a missing tooth or teeth. The bridge is held in place by crowns placed on the healthy teeth on each side of the space that is to be filled. Our bridges are mostly metal-free. As a result, they absorb light just as natural teeth do to create a beautiful, natural-looking smile. Most importantly, our bridges are created and custom-fitted based on careful measurements, 3 dimensional model jaw movement simulators, models, mock-ups and intermediate "trial" restorations so that the fit and appearance of your bridge is perfect. Bridges stabilize the position of your teeth to help correct some bite problems and improve speech. We use the very best laboratories and technicians to custom create and fit your crowns and bridges for strength, endurance and appearance. Crowns can also be used for cosmetic purposes, enhancing the appearance of a tooth that is discolored or misshapen. If your teeth have been badly damaged or need structural integrity and support, dental crowns can be an effective treatment option. Our crowns are shaped and colored like a natural tooth to restore strength and eliminate discomfort. 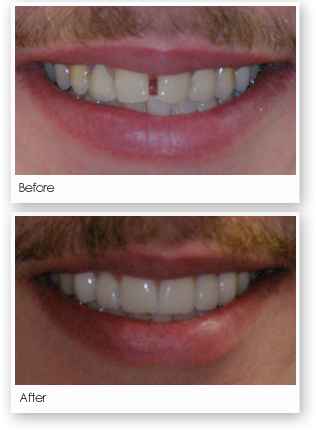 As always all of these restorations are done with the same careful planning and design to give you superior results.